Cincinnati Dowel & Wood Products > Welcome! Thank you for visiting the new Cincinnati Dowel website. We are your online destination for hardwood dowels, buttons, plugs, craft parts, abrasives, glue, shims, cedar toys, and much more. 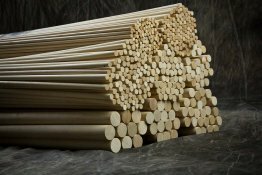 Cincinnati Dowel & Wood Products Company has manufactured hardwood dowels, buttons, plugs and other turnings since 1925. We offer our products in an extensive selection of tree species, including oak, maple, poplar, beech, hickory, walnut, cherry, mahogany, ash, teak, pine and birch. We are centrally located in the greater Cincinnati area, and strive to provide excellent service as well as prompt delivery times. If you are new to our website please take a look around and see all that we have to offer. We offer FREE shipping on all orders over $50 anywhere in the continental United States. If you are a returning customer, we would first like to say welcome back! We have been hard at work improving your shopping experience. We hope you will enjoy our new website and the new features that come with it. We rebuilt our website from the ground up with the latest Ecommerce technology. If you had an account with us previously, your email address has been migrated and will be your username. You will need to use our password reset option in order to set up your new account. Having issues? Give us a call and we will try to help! If you have any questions, or are looking for something that is not listed on our store, please feel free to contact us and we will try our best to make sure you find what you are looking for. We pride ourselves on complete customer satisfaction and work hard, every day, to achieve it. That being said, we are always looking for ways to improve our site, so please send us any feedback regarding ideas or suggestions you might have. Follow us to stay up to date on the latest news!